"... knocked down a number of street lamp poles"
Kirk Milburn, a construction supervisor for Atlantis Co. was on the exit of Interstate 395. "... saw debris flying. I guess it was hitting light poles." "It was tilting its wings up and down like it was trying to balance. It hit some lamp posts .."
Kat Gaines, a Fairfax County Fire & Rescue technician was heading south on Route 110, by the parking lots to the south when she saw a "low-flying jetliner strike the top of nearby telephone poles." She "then heard the plane power up" and plunge into the Pentagon. "The tail of the plane clipped the overhanging exit sign above me"
"... knocking over light poles "
"It knocked over a few light poles on its way..."
"The plane clipped the top of a light pole just before it got to us, injuring a taxi driver, whose taxi was just a few feet away from my car. Jim R. Cissell, a former photojournalist, drives past the Pentagon every day on his way to work at the Newseum in Arlington, Va. .".. taking out telephone and power lines on its way in, hit the building." 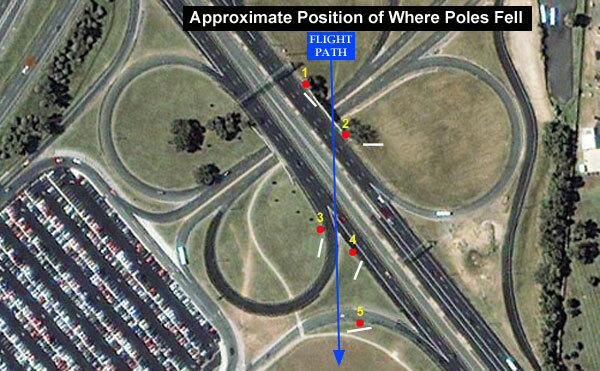 It "The plane’s right wheel struck a light pole, causing it to fly at a 45-degree angle.". ", he said. The plane tried to recover, but hit a second light pole and continued flying at an angle. "You could hear the engines being revved up even higher,"
"... the craft clipped a utility pole guide wire, which may have slowed it down a bit"
Air Force Honor Guard members were at the end of the cemetery directly across the highway from the Pentagon.
" They had heard, some had seen a plane coming in skimming trees and light poles." Mark Bright, 32, a traffic patrol officer was the first to arrive at the scene after seeing the plane from his guard booth by the Mall Entrance.
" -- at the height of the street lights. It knocked a couple down." He also said he heard the plane "power-up"
Wanda Ramey, a DPS master patrol office watched from the Mall plaza booth. "I saw the wing of the plane clip the light post, and it made the plane slant. Then the engine revved up." "...poles lying on the ground that had apparently been knocked over by the plane as it headed for the building." "...It turned and then it went around ..it clipped one of these light poles." The only thing we saw on the ground outside there was a piece of a ... the tail of a lamp post. Recorded interview - quick load / May 2002. Recorded interview - best quality / May 2002. "It was a good size jet aircraft. I saw it clip a light pole but keep coming ..."
Don Fortunato, a plainclothes detective with the Arlington (Va.) Police Department, was walking into his office when he heard a muffled explosion. He dashed to the scene. LaVern L Schueller, a Military Chaplain surveyed the scene after the event. 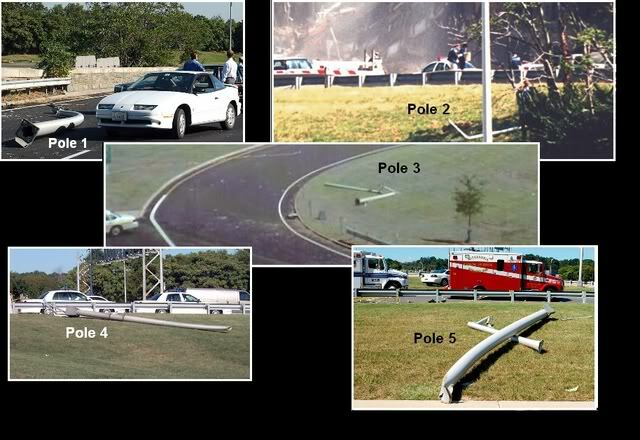 "The top of a light pole was knocked off on an overpass. The FBI had marked it as evidence. The top of a light pole had been knocked off on the street that goes by the Pentagon. It too was marked as evidence. And finally, it took out the entire light pole near the sidewalk. Frank Probst, dove to the ground to avoid a passing jet engine. "On either side of him, three streetlights had been sheared in half by the airliner's wings at 12 to 15 feet above the ground. An engine had clipped the antenna off a Jeep Grand Cherokee stalled in traffic not far away."